Ah, cast iron cookware! Other than earthen-ware cooking vessels, cast iron is one of the oldest and lowest-tech cooking vessels that still exists, and strangely enough…technology has YET to replicate a pot or pan that cooks better than cast iron. When properly “seasoned” it is nonstick, without the need for harsh chemicals that go into “nonstick” cooking surfaces like Teflon. It will never warp or lose its effectiveness. It can be used on all cooking surfaces, from gas to ceramic to metal-element, to the newer and more efficient induction burners. It cooks perfectly, absorbing vast amounts of heat and radiating it slowly and evenly, resulting in a perfect pan fry, sear, or saute. I challenge ANY of you out there to give me a better sear on a steak, or a more perfectly pan-fried catfish fillet using your fancy $200 triple-ply copper core pans. My $20 cast iron skillet will beat yours every single time. The way I see it, there are only two drawbacks to cast iron. First of all is the maintenance. You can’t toss your cast iron skillet into the dishwasher, or leave it full of water overnight to soak. Cast iron rusts, even if its perfectly seasoned. (I’ll explain seasoning in a bit.) So you have to wash and thoroughly dry your cast iron pan or pot after you use it. The second is weight. If you don’t have a lot of strength in your hands and arms, some cast iron skillets and Dutch ovens and griddles can be very heavy to pull out from high or low cupboards. However, its benefits far outweigh its drawbacks. I know some people who cook EXCLUSIVELY on cast iron. My friend Nana got rid of all her nonstick cookware when she had her first child, and cooks ONLY on cast iron. She has everything in cast iron, from a muffin pan to a waffle iron. And BOY is her food good. 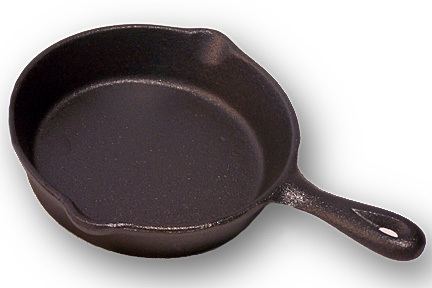 Cast iron can rust, and its natural surface is not non-stick. This means it has to be “seasoned” before use…basically that means coating the entire pan or pot with a layer of carbonized fat (burnt oil) that protects the iron’s surface from liquid and air, and makes the pan nonstick. Everyone has their own method for seasoning, since cast iron has been around for so long, and everyone thinks theirs is the right way to do it. The best scientific approach is to start with a clean, unseasoned pan (or a rehabilitated pan, which I’ll address in a second). If you’ve just bought a new, unseasoned pan, there is a layer of wax on it that needs to be washed off with soap and hot water first, then thoroughly dried. Get a bottle of flaxseed oil from your health food store (it will be in the refrigerated section). If you can’t find this, avocado oil is the next best thing, followed by canola oil. Heat your pan in a 200F oven for 5-10 minutes to ensure that it’s dry and the iron’s pores have opened. Pour about a Tablespoon of oil into the warm pan, and using a paper towel, smear the oil all over the pan, inside and outside, even the handle. Then take a clean paper towel and wipe everything off. This will leave a thin, almost invisible layer of oil. Place the pan upside down on the middle rack of your oven, and turn the heat to 500F. When the oven comes to temperature, set your timer for an hour. After the hour, turn off the oven but leave the pan inside for a few hours to cool. Repeat this process SIX times. I know that sounds like a lot, but it will give you a perfectly nonstick surface that will last pretty much forever if you take care of your pans. Apple Pie in a Cast Iron Skillet...nothing better! Maintenance of cast iron is pretty simple. After you’re done cooking, wash the pan. Try not to use soap, as this may begin to eat away at the seasoning layer. Because the pan is nonstick, it will generally clean with warm water. Use a drop of soap if you have to. Then THOROUGHLY dry the pan. (Sometimes I just place it on a burner over medium low for 5-10 minutes to ensure all the water is gone.) Then place a drop or two of canola oil in the pan or spray lightly with cooking spray, smear around with a paper towel, and store away. 1. Place the pan upside down in your oven and put the oven on its self clean cycle. This will take several hours and will heat up your house and make it smell really bad, but it will clean your oven in the process. After the pan cools, all the gunk and rust will have burnt off, you can wash the pan, and proceed with seasoning. 2. Get a lye-based oven cleaner. Spray your pan on all sides, then wrap the pan inside a kitchen trash bag and let it sit on your porch for 2 days. Then wash the pan thoroughly, dry, and season it. If you’re lucky, you may inherit a set of cast iron from someone in your family, which has been lovingly seasoned and cooked on for generations. This is the BEST way to get cast iron! The only improvement that has ever been made to this best-of-the-best cookware is the invention of enameled cast iron. The manufacturer coast the cast iron with a layer of ceramic enamel and bakes it at extremely high temperatures to fuse the ceramic to the iron. This technique has been popularized by the French brand “Le Creuset” which sells their enameled cast iron at an offensively exorbitant price. Luckily you can buy off-brand enameled cast iron for much cheaper. 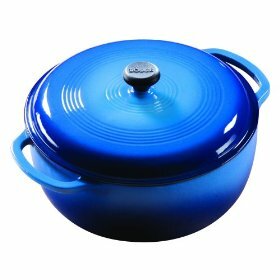 A 6-quart Dutch oven which normally costs hundreds of dollars from Le Creuset can cost only $50 or $60 from The Lodge or Paula Deen. And you can often get them on clearance for less. The coating of enameled ceramic means you don’t have to worry about rust except on the places where the actual cast iron is exposed, like right around the rim of the pan. That needs to be seasoned once (just one oil/bake session) and it’s good-to-go. The drawback to enameled cast iron is that the enamel is brittle and can shatter if you drop the pan, close the lid too hard, etc. If you want to take your cooking to the next level, get yourself some cast iron. 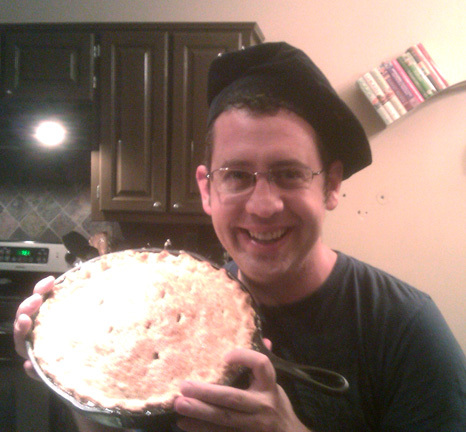 I heartily recommend a single large skillet, which you can use for pan frying, searing steaks, baking cornbread or apple pies or biscuits or tart tatin, and a cast iron Dutch oven (or enameled one) which you can use for soups, stews, and baking bread. My next choice would be a griddle for pancakes, which is also great for searing, making tortillas, etc. This entry was posted in Blog and tagged cast iron, Dutch oven, enameled, rehabilitating, seasoning, used. Bookmark the permalink. Pick up the pan, flip it over, and knock on the bottom of it. If it rings like a bell, it’s in good shape. If it has a dull sound, it likely has a crack which the seasoning/old crud is hiding. You do not want to buy cracked cast iron. Also, check out around where the handle connects to the pan proper. You want to make sure there’s no signs of cracks there as well since that area takes a lot of stress. I tried the Barlean’s Flax Seed Oil method of seasoning twice following the instructions carefully. I found that it works very well for some foods, but some foods react with the seasoning and cause it to fail. I suspect certain foods cause a chemical reaction with the seasoning. I re-seasoned with avocado oil and so far it seems to hold up better than the flax seed oil seasoning. I agree, if you can find hand-me down iron cookware, it is the best. My aunt and uncle are 87 years old and still use their iron cookware they bought over 50 years ago. The seasoning is incredible. Hope they leave this cookware to me! I want one of these heavy cast iron skillets like in the olden days. Where do I go to get one? Hi, Patsy! You can get brand new cast iron at WalMart or any big outdoor supply store (Cabela’s, Bass Pro, Academy, etc.) You can often find old cast iron at thrift stores and garage sales. Don’t worry if it’s rusty or crusty, you can easily rehabilitate it at home with some oven cleaner and/or the self clean cycle in your oven.